Better described as invisible speakers, in-wall speakers are designed in such way that they rhyme with the out of sight out of mind; until you experience the detailed and rich sound that comes from them. These speakers perfectly hides away in your walls ensuring that you can continue to enjoy quality audio in rooms where normal speakers cant fit. They are now quite popular among most home theatre enthusiasts. In the past few years, even for the most insistent clients,in-wall speakers sound good enough providing a good match to the free-standing models. People are increasingly becoming aware of how indigenous these speakers are and how they have improved since inception. The ease of installation and general improvement in acoustic quality have given in-wall speakers a competitive advantage over regular speakers. On top of providing good quality sound, in-wall speakers save a lot of floor space and blend well with any interior. It is for this reasons that this article seeks to help you establish if in-wall speakers are indeed right for you. It will give you some ideas on some of the benefits of these speakers, how they work, how to go about selecting your speakers and the installation process. Generally, cables are not so appealing to the eyes not forgetting that they are also a safety hazard. The wiring of in-wall speakers is completely hidden from view and they can be painted to match your décor. As they say, it takes really good décor to make a property and these speakers are here to ensure that. These days space is limited. 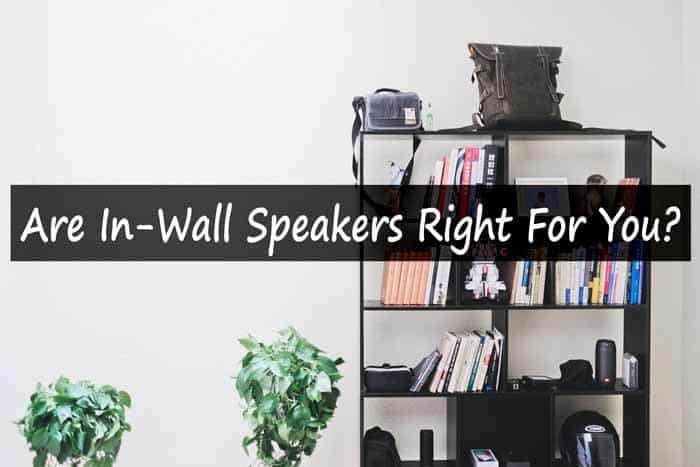 In-walls are mounted in the wall which means that you don't have to find a place for them, making them perfect choice for crowded or small rooms and for those who, frankly, don’t want to see speakers. The wall cavity acts as the speaker cabinet which makes the base response excellent. Most in-wall speakers models are resilient, often lasting for many years, and some are moisture resistant which means that they can be installed in laundry room, bathrooms, and other moist areas. In-wall Speaker Basics: How Do They Work? In-wall speakers are mounted on a specially designed frame in the wall as opposed to conventional speakers which comes with a cabinet. As such, they use the wall cavity as the cabinet. Most models of these speakers have a dedicated base and high-pitched tones which helps in tuning your speakers to go with the entire speaker system after installation. Having a back box specifically designed for your in-wall speaker will go a long way in helping you control the performance of your in-wall speaker. In addition to this, this box ensures that there is total control over resonance and that proper tone balance is maintained as per the entire speaker system. How Do You Go About Selecting Your Speakers? Just as in like selecting conventional speakers, the process of selecting your in-wall speakers should consider factors such as speaker sensitivity that is how well the power sent from the amplifier isused, the amount of amplifier power that the speaker can stand among others. Nevertheless, when planning your in-wall music system there are two major things that one needs to keep in mind. First is the number of speakers required in each room for great sound. This will be determined by how big or small the room is and how the room is being used. The other important consideration is the placement of the speakers. This requires proper planning for you to get even distribution of sound in the entire room. While selecting your speakers, ensure that they fit your specific application. This means that for example, speakers meant for the surrounds cannot be substituted for those meant for the main fronts and vice versa is true. Installing in-walls is relatively easy but it is highly recommended to seek the services of a qualified video/audio installer to give it a professional touch. Having a good music system installed demands for expertise and experience. One of the most important considerations even before you buy your speakers is to determine where you are going to install them. How you place them will depend on the architectural design of the room and consequently, this will determine how you are going to listen to them. Budget allocation will be guided by performance goals and listening experience expected in each room. In-wall speakers which have been described earlier as invisible speakers are definitely the future of sound systems and they have one undeniable advantage that is so evident and remains unrefuted- they provide high-quality sound without cluttering up your décor and you won't have to listen to complaints about the way your speakers look or knocking down your speakers every now and then. © 2019 by SpeakerChampion.com is a participant in the Amazon Services LLC Associates Program, an affiliate advertising program designed to provide a means for website owners to earn advertising fees by advertising and linking to amazon(.com, .co.uk, .ca etc) and any other website that may be affiliated with Amazon Service LLC Associates Program.